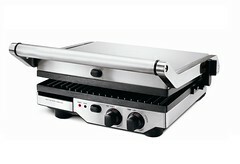 The BGR400XL ikon Removable Plate Grill – Non-stick plates remove for easy cleaning and are dishwasher safe. Create paninis or grill meat with ease. 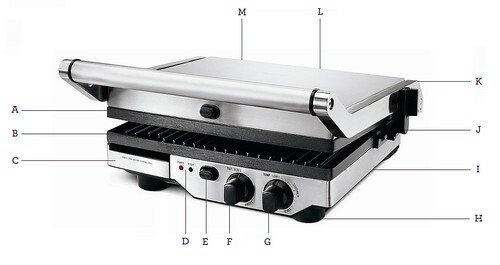 Top plate has six adjustable height settings to keep plates off of delicate foods like fish while cooking. Higher settings are ideal for reheating and open-face sandwiches. A. Non-Stick Scratch Resistant Surface. B. Unique Angled Grill Plates for Easy Fat Removal. C. Removable Drip Tray. D. Power 'ON' and 'READY' Lights. E. Plate Release Buttons for Easy Removal. F. Plate Tilt Control Function. G. Variable Temperature Control. H. Extendable Non-Skid Feet. I. Cord Storage. J. Adjustable Grilling Height Control. K. Heavy Duty Metal Arms. L. Stainless Steel Exterior. M. Floating Hinged Top Plate.